Have you ever wondered what it would take to book in the really high quality shows that would elevate your career and status? I can answer those questions with one word – RELATIONSHIPS! See, 30 years ago I realized that being an entertainer means that you are in show BUSINESS, and that you needed to learn the business side of things as well as just being a great performer. That meant meeting and building strong relationships with the people who run the BUSINESS side of the show. So, what does that mean for YOU! You don’t have 30 years to build up all of these relationships. Let alone learn all the ins and out of how it is even done. 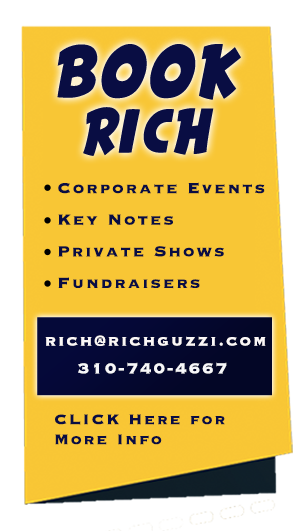 Sunday, Monday & Tuesday, JULY 14 – 16 — High above the Las Vegas Strip for the first time ever, RICH GUZZI will bring the answers to YOU and bring in the POWER PLAYERS. People who Book shows on CRUISE SHIPS, in COMEDY CLUBS, for CORPORATIONS, in THEATERS, at CASINOS, for COLLEGES, and all the rest. AND YOU WILL MEET THEM LIVE!!! We are going FIRST CLASS all the way. First off, the training facility will be a giant 3000 square foot Suite at the Aria Hotel complete with conference room just like you see in the movies. Bring a camera because nobody is going to believe it. Each of the BOOKERS and industry PLAYERS will be interviewed by RICH GUZZI. Special questions are prepared so you can get the most value from all the speakers. Plus each speaker will give their own presentation along with a Q&A session. Breakfast and Lunch will be catered in every day and is also included with the training. This also is designed to be a NETWORKING opportunity so you can “Break Bread” With the Industry people to form your own RELATIONSHIPS. Each day of the BOOTCAMP will start at 10:00 AM. This is LAS VEGAS. You are supposed to have some FUN here too. Nobody wants to go to bed at 2:00 AM and have to wake up at 6:00 AM for a 7:00 am o’clock start time. Each day we end at about 6:00 PM or a bit after if some of the Q & A goes over. We will then have an Open Bar with some light snacks so you can spend some time with the BOOKERS. Then we hit Vegas and experience everything it has to offer with some of your new friends, like some of the best restaurants, entertainment and nightlife you can possibly imagine. THIS OPPORTUNITY IS ONLY AVAILABLE TO 20 APPLICANTS. Total investment is $5000 however it is only $2500 for the FIRST 10 APPLICANTS. This is an AMAZING DEAL and a once in a Lifetime, Chance to meet the exact people you want to start a relationship within this business.